cooker, microwave, fridge, freezer, and all utensils. There is also a washer, dryer, iron & ironing board. regret pets are not allowed. FREE crib, high chair, stroller & stair gates are available. Everything was as advertised and Iain was a pleasure to deal with. 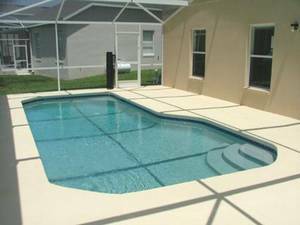 I would have no hesitation in recommending this villa to anybody planning to spend time in Orlando. bonus to keep the two children occupied. when we weren't in the pool or hot tub. 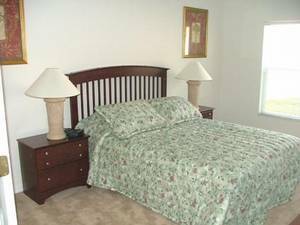 As 3 couples in our fifties visiting Orlando for the first time, we have found the Villa spacious and very well equiped for all our needs. The Property Management representative was extremely helpful and resolved minor problems quickly and efficiently. The only negative was that the swimming pool could have been warmer (bearing in mind it was March and the weather was much cooler than average for that time of year). The ladies of the party would recommend the addition of a full length mirror somewhere in the villa. Homeowner Response: Thanks for the kind comments. We investigated the pool temperature and found there was actually a fault with the heater which was repaired this week. says it all! Has everything you need. This is a great villa. This was a family vacation which included three children under the age of 8 and the game room and pool were HUGE hits! We had one rainy day and that was no problem because of the amenities in the villa. We enjoyed Disney's Downtown, Magic Kingdom and Animal Kingdom as well as Sea World and all were within very easy driving distance. A great time and we would definitely stay again. 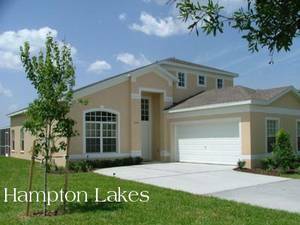 This was one of the nicest homes we have ever rented in the Orlando area and at a very good value. Very clean, well stocked with plenty of space for our extended family of 11. The private pool, hot tub, PS2, DVD Player, TVs, foosball, air hockey, pool table, sand volleyball court, tennis courts, basketball goals and community pool provided plenty of entertainment options for all of our family members. We enjoyed it so much we extended our stay for an extra day. The owner and management company were delightful to work with. The owner sent us everything we needed in advance and was very responsive to ongoing questions. Absolutely fantastic, everything you need to live in and more! Fab pool, hot tub and hours of fun in the games room! Alarm provided extra security and peace of mind! Only downfall was the BBQ, you really couldn't use it but that is easily renewed! Thanks so much and we will hopefully return! Superb stay. Villa is excellent, with everything you need. Hot Tub is a great addition too. A definate recommendation. Hope to be back in the future. This was one of the nicest homes we ever rented. It was a quiet neighborhood. There was a nice pool, excellent game room and we recommend this home to everyone. We had a hard time getting the kids out of the pool and the game room. resolve a couple of very minor problems. 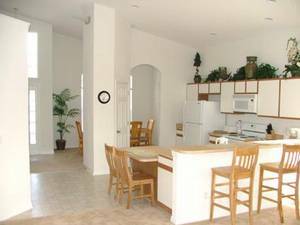 This was one of the nicest homes we have ever rented in the Orlando area and at a very good value. Very clean, well stocked with plenty of space for our extended family of 11. The private pool, hot tub, PS2, DVD Player, TVs, foosball, air hockey, pool table, sand volleyball court, tennis courts, basketball goals and community pool provided plenty of entertainment options for all of our family members. We enjoyed it so much we extended our stay for an extra day. The owner and management company were delightful to work with. The owner sent us everything we needed in advance and was very responsive to ongoing questions. The location is a little further away from Disney than some others that we stayed at, but I highly recommend this home. Spent the last 2 weeks in March at the villa and had a fantastic holiday. This was our 2nd holiday at a villa in the Hampton Lakes and it is definitely the best location in the Highway 27 area. The villa has lots of facilities, not least the excellent games room and pool area. A definite winner for anybody looking for a nice home away from home and would definitely recommend it. We had the perfect Christmas vacation while staying at your villa. 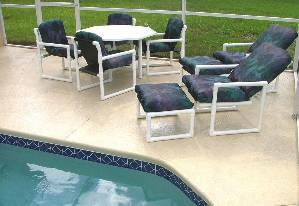 The pool was heated when we first arrived, the house was clean and very comfortable, and conveniently located. We had 6 people staying in the villa and we had more than enough towels and bedding, so other visitors to the villa wouldn't need to pack the extra towels. The neighbourhood is wonderful! 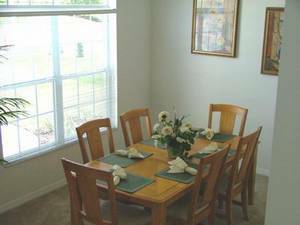 Without hesitation, we recommend this villa to anyone who plans on visiting the Orlando area. Thank-you for sharing your home with us. We really enjoyed our stay at this home, there was plenty of room for everyone. Just having a stove, washing & dryer, dishes and appliance made the vacation more enjoyable and less expensive. The children really enjoyed having a swimming pool there. We were overall very pleased with the Villa. 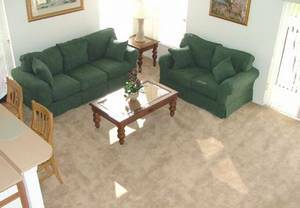 We were comfortable with 6 adults and five children ages 6 months to 14 years. The games room, PS2 and pool warded off any restless moments for them. I was more at ease with the pool alarm for my children's safety. The many, many extras made this villa stand out including the property management personnel who were helpful and friendly. We would return to this Villa without hesitation but the following would be welcome improvements. It would have been more comfortable for the bedrooms to have room darkening curtains as it was very bright very early in the Am. Also we were expecting to BBQ in the evenings but the advertised BBQ was not fit for use and we were quite sure it wasn't even a BBQ perhaps a charcoal smoker. We will recommend and return! We had a great time over Spring Break. The villa was wonderful. It had all the amenities that were listed. The neighborhood was very nice. The pool was also nice. We would recommend this villa to anyone. We had a great time in Orlando. The Villa was very comfortable. Pool (heated) was great, game room got lot's of use. Plenty of room. Loacation an A+. Wish for: larger T.V. in Family room. We just returned from a week at your villa. It was wonderful! My wife and I are Grandma & Grandpa. Three of our kids and their spouses came with us as well as 4 grandchildren. There was loads of room. We did ues every bed though. It was great to have the laundry facility, as we had another 5 days on board a cruise ship after Orlando. We (Grandma & I) spent a day at the villa with our youngest grandchild (1 yr). He needed a good rest and it was a good excuse for the old couple to relax after the 10 mile per day hike around Disney for three days. I would recommend this property in a heatbeat. Even if you are only one couple, you couldn't do a hotel + meals out every day cheaper. Great value. Just back from a wonderfull 2 weeks in florida. Villa was lovely and only added to the enjoyement we had. Only negative point was it took several attempts to have the pool at a temperture I would class as being warm and the table at the poolside was broken, could be dangerous for young children. p.s. A special thanks to steve and alison who were able to sort out any problems we had at the villa. Excellent property/ location for the delights of Orlando. Our 3rd stay in a house on a Florida holiday & the best property we have stayed in. A home from home & I would have no hesitation in recommending the property to friends / family. Games room much enjoyed and used by me/the kids - a nice addition. We stayed in the house back in February with another family and found it quite comfortable with a house-full! It was clean and bright. Only negative was it took 2 days before the pool was warm enough. We were agreeably surprised: your villa is still better than what we have expected! And we will transmit your website adress to all of ours friends! Iain, your villa is probably the nicest place we have ever stayed while visiting Florida over the past twenty years. Our sons and their families did six straight days of theme parks while Papaw and I sat by the pool and relaxed. In the evenings, the teenagers made good use of the game room and now are wanting one of their own at home!! The "private" pool is a lovely addition to our vacation also. We had one small problem with a shower stall door and all it took was one quick call and the repair-man was there to fix it. What great service. I would definitely recommend your villa to anyone planning a trip to Orlando. Second time at the villa. Needless to say we had a great time. Highly recommend the pool heating if you're going out in one of the cooler months. 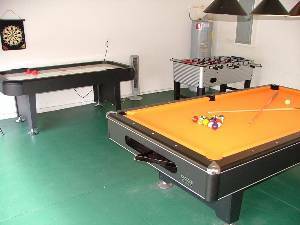 Villa is very clean and comfortable with lots of pool toys/games (PS2, Pool Table etc.) to keep the kids happy. Your home has truly made my vacation one worth writing down in the book. The pictures displayed on your web page gives your home absolutely no justice at all. Your home was just immaculate and catered to our every need and wants. Thank you from the bottom of our hearts!!! This is a wonderful place to stay during your vacation. The villa is very spacious and conveniently located. We spent one day just hanging out at the house and really enjoyed the pool and game room. Highly recommended!! had a wonderful holiday and was so good to come back to a wonderful villa.spacious,well furnished,quiet and beautifully located.we will be back for sure.excellent!! Our family enjoyed a wonderful vacation in Orlando while staying at the villa. The kids had a great time swimming and using the game room. It was nice to have such a large space to relax in. The location was perfect. We will definitely stay at the villa during our future visits. Thanks for a fabulous place to call "home" during our week "up north" from the Miami area. Traveling with two toddlers is not fun if you're stuck in a hotel. The villa was the perfect answer. Unfortunately it rained too much for our taste, so we weren't able to enjoy the pool as much as we would have liked. But everything else was great. The villa was fantastic and a great base for a wonderful holiday. We got good use out of the pool to cool off in after busy days at the many Florida attractions. We would definitely recommend the villa to others and hope to be able to return. Thanks Iain!! Your Villa was our point of quality time and family share after long and exhausting days but full of joy... Our parks agenda was full but the the two full days and every evening we pass there was awsome and we really enjoy it. We will definitively recommend it to other groups. The house was lovely,everything was perfect,the boys loved the quality pool table. We had a wonderful holiday, with the villa being the hub of our enjoyment. Everything about the villa was great - we would be happy to live there permanently! We absolutely loved the villa! We have just returned home a week ago and have already recommended the villa to many family, friends and colleagues. It has all of the ammenities you could ask for and more! Being 5 months pregnant at the present time, with friends also starting families, we would love to return to the villa and feel it has all the extras required to make for a comfortable stay, especially with small children. The pool was wonderful and we got lots of use out of the stroller. The villa was very clean and made us feel at home. Iain was very easy to deal with and very responsive, making this trip a breeze to plan. We had a wonderful time staying in your home. We will definitely recommend it to other people. And hopefully we will also be back very soon. We loved all the extra activities in the house, this house is great for families with children. And the heated pool was great. Thank you very much for a wonderful stay. We really enjoyed our stay at Villa. It was the first time in over a year our family was together in one place. Villa was able to acommodate 10 of us very comfortably. My 3 sons and 3 grandchildren enjoyed the pool, air hockey and pool table. The close proximity to Disney[ about 15 min]was great. Would reccomend Villa to any of our friends or family if they are going to Disney. Lots of fun!! We really enjoyed our stay in Orlando. The villa was excellent! To most of us it felt just like we were staying at home. The house was very clean, particularly the bed sheets. The villa was indeed very spacious and we loved the high ceilinged lowest level. Staying in this villa made this vacation very relaxing as we weren't always forced to eat out and we had a pool all to ourselves. The arrangement of the villa was very nice as all the facilities were available. Have just returned from a super holiday in Orlando, despite Hurricane Charley. Villa was wonderful, all we expected and more... plenty of space, clean, tidy and very comfortable, all new facilities. Safety is well taken care of, especially for children. We enjoyed the play station, pool and air hockey games, ideal entertainment in a thunderstorm! Thanks for a lovely time. This villa is a terrific place to stay. It is very spacious, attractive, well kept, clean, and in a good location. The owner was very responsive on getting the booking set up, very easy to deal with, and plesant. We really enjoyed our stay and had absolutely no problems or complaints. We hope that all our guests will share their experience of our new home by adding a few lines to this website. We have tried to make the villa as comfortable as possible and we have added a number of 'extras' to enhance the enjoyment of your vacation and make it as safe as possible. Your satisfaction is very important to us. We know how important it is for you to enjoy your stay and if there is anything we can do to improve it for your next visit then we are open to suggestions. As the first 2 families to have spent their holiday in this beautiful villa we feel very priveledged but also very sad to be going home. We have had a fantastic fortnight, got a taste of Florida and would love to return!Many thanks for letting us use your home. Deposit: A Booking Deposit secures a reservation until 60 days prior to arrival when the full balance is payable. The Security Deposit is refunded within 21 days of your departure providing no damage or loss is reported by our local management company.